The X1000 and X500 are specifically made with metal housings that won't crack in the cold. They dissipate heat better and are built to last. They feature larger output 50 mW laser diodes, which means better colors and brighter lights. Entry-level laser lights only have 10-30 mW diodes. The X1000 and X500 are also IP65 rated for waterproofing, which means they are true indoor/outdoor lasers that perform in a wider temperature range from -4 to 104 degrees. Christmas laser lights can be used in many creative ways. Simply placing your lasers closer to the base of large trees and tilting them to point up the trunk can create laser tree wraps. 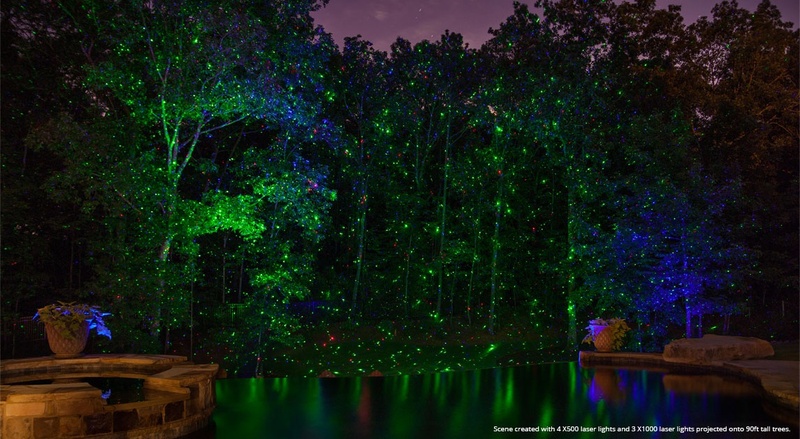 Place lasers around the base of small trees and hedges to create a canopy of unforgettable lights. And don't forget the biggest surface of all...the ground! 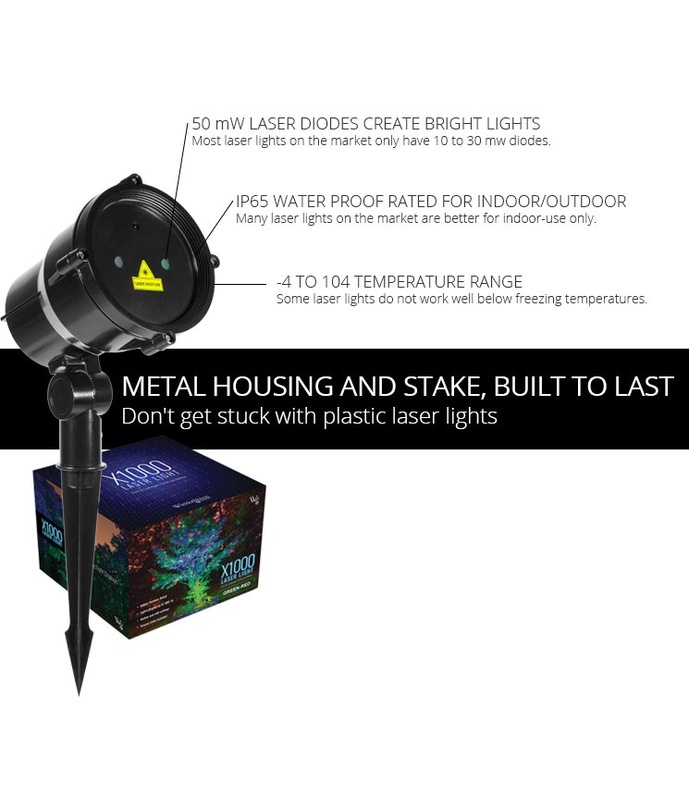 Place your laser lights pointing down to the ground from higher spots like decks, second story windows, gutters and trees and light up your entire yard like never before. A laser projector's distance to an object will change the look and size of the laser point pattern, which means you can easily customize the look of your lasers. The closer you place your lasers to an object, the denser your laser points will be. The further you place your laser from an object, the wider the laser points become and the larger the entire laser display will be. A laser projector placed 10 ft. from a wall will emit laser points onto the ground as well as spanning 30-60 ft.+ across the wall. However, the most visible laser light points will be within about a 30 ft. span directly in front of your projector. The X500 and X1000 emit laser points at a very wide angle, which is why laser points can span up to 60 ft. wide when only 10 ft. from a wall. However, the laser points at the far ends of the display have much more space between them. 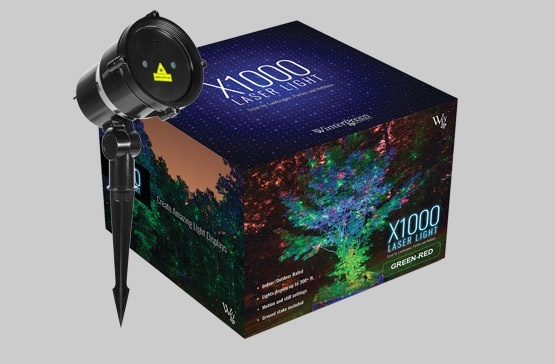 If you are using your laser projector on small bushes or trees you can place the projector closer to achieve a denser laser point pattern. Simply move your projector closer or further from the bush or tree to get the look you think is best. 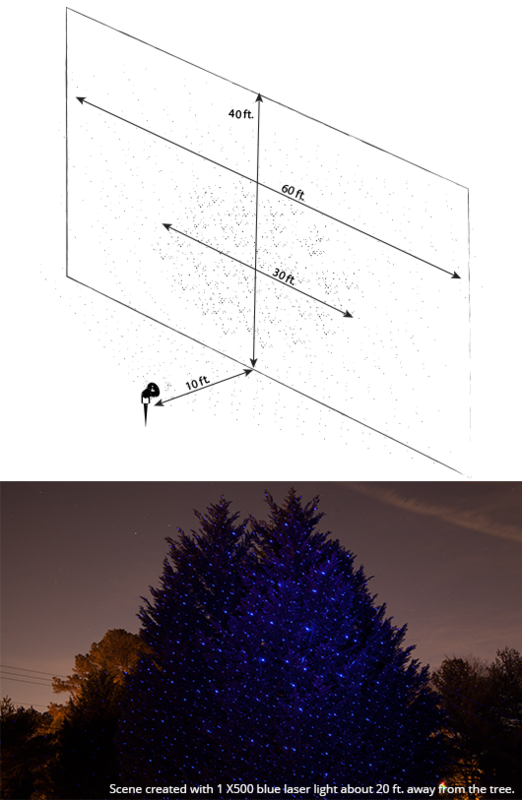 Laser projectors can also be placed right next to large tree trunks and angled up the tree to create the look of tree wrap lights. 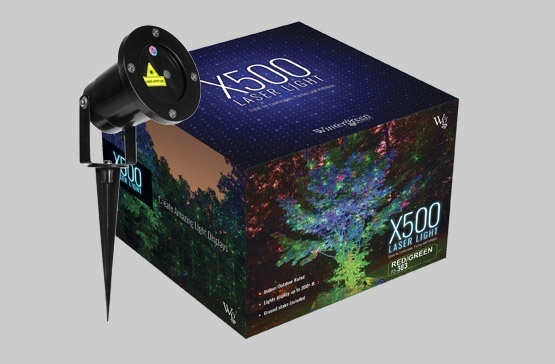 The X500 and X1000 can both project laser points to the top of trees 100 ft. tall but the laser projector must placed 25-30+ feet away from the tree in order to achieve the best angle for the tree top. Laser lights look great on homes, roof tops and along walls and you can place them virtually anywhere to achieve different and creative looks. For example, laser lights can be placed very close to walls and angled up the wall to create unique patterns. Or, they can be placed further away from the house to cover larger sections of the structure. 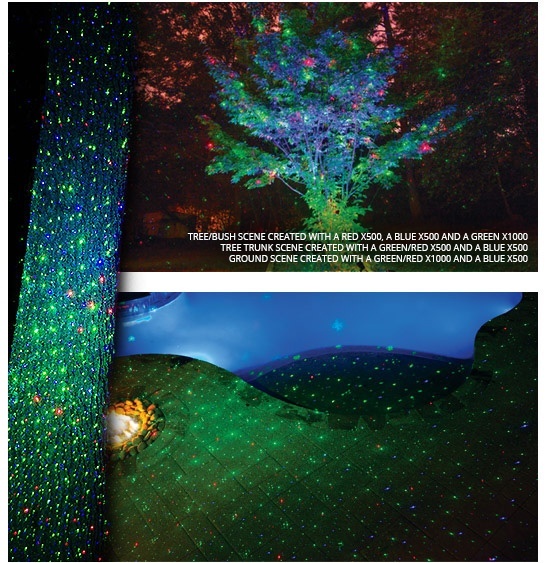 Different color laser lights can also be overlapped onto different surfaces to create amazing color displays.